These remarkable Japanese Kit Kats are made with wasabi! It’s not fake wasabi or the imitation horseradish that’s often passed off as cheap “wasabi” either. Nestle Japan teamed up with the huge Tamaruya-Honten Co Ltd (who has been manufacturing wasabi since 1875) to make these delicious snacks. 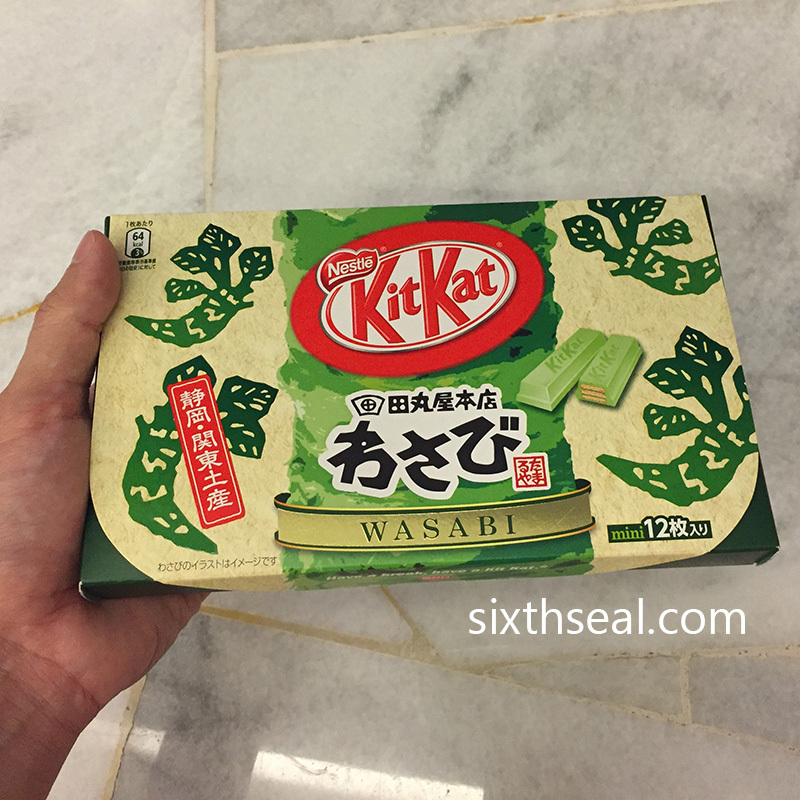 I couldn’t resist trying this weird flavor so I snapped up the Wasabi Kit Kat as soon as I saw them. There are 12 pieces of Kit Kats in the box, all individually wrapped. A regular pack in Japan holds 3 wrapped pieces of 2 Kit Kat mini bars so this is four times the amount. 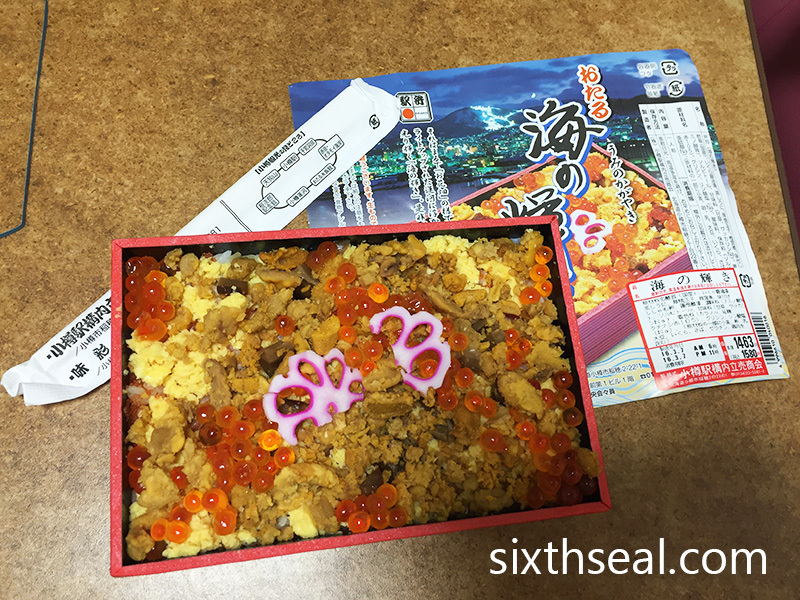 It’s presented in a nice box meant as omiyage (souvenirs). 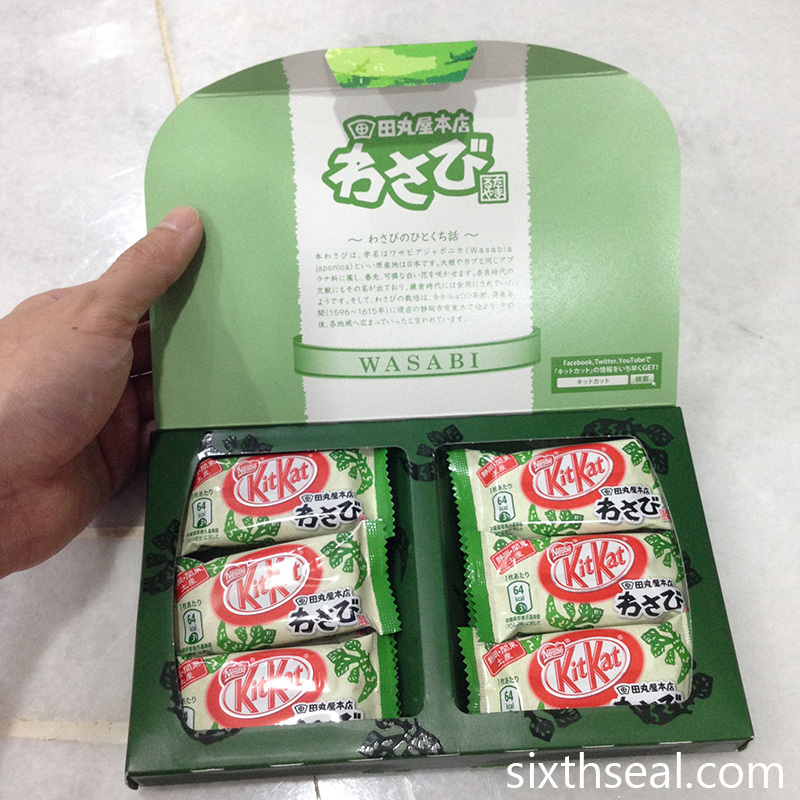 It opens up from the front to reveal two rows of Wasabi Flavored Kit Kats. There is writing on the flip side of the cover which explains the provenance of the product. No, I didn’t inexplicably start reading Japanese from a single trip to Hokkaido. I took a photo of the text with Google Translate and it showed me the English translation. That’s actually how we got around in Japan when we were there earlier this year. Haha. These are special edition Kit Kat from the Shizuoka-Kanto area. Tamaruya-Honten uses only wasabi from the Shizuoka Prefecture with no coloring and horseradish added. The latter two is basically what makes up virtually 100% of wasabi locally. 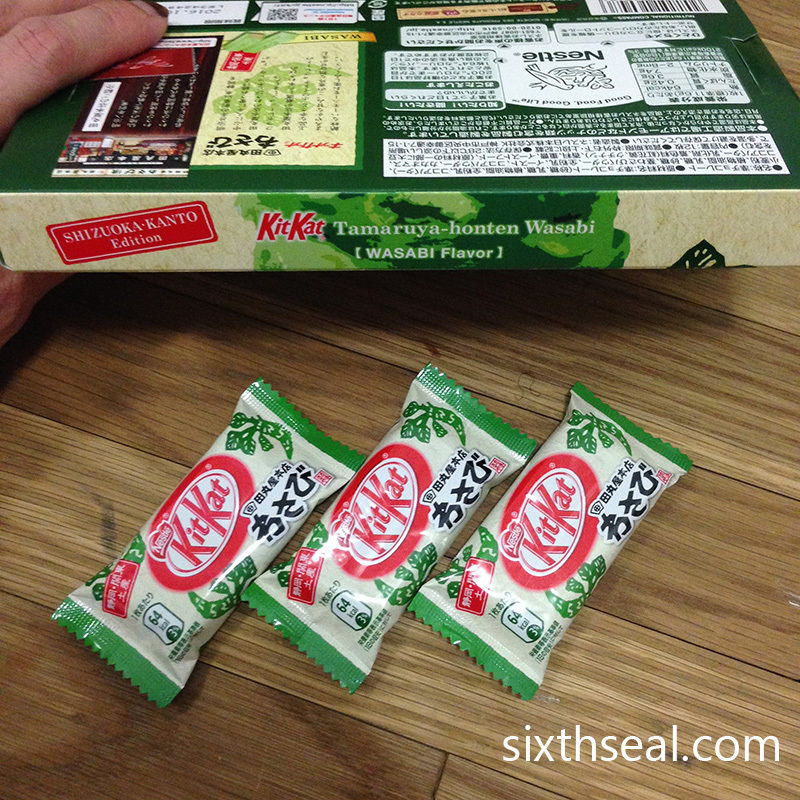 No such shenanigans here, the stuff Nestle Japan puts in these Kit Kats is real wasabi made by a reputable wasabi manufacturer. There is a blurb at the back introducing Tamaruya and a link to their website. I believe “honten” means original shop. I took a bite and was startled to find out that the wasabi flavor was really strong. It cleared up my sinuses and I could taste/feel the pungent wasabi notes through my nose. It was not unpleasant but the taste combination was strange. My better half didn’t like it though, she found the strong wasabi kick rather off-putting. I didn’t mind, I’m quite fond of wasabi but honestly it doesn’t go very well with chocolate. 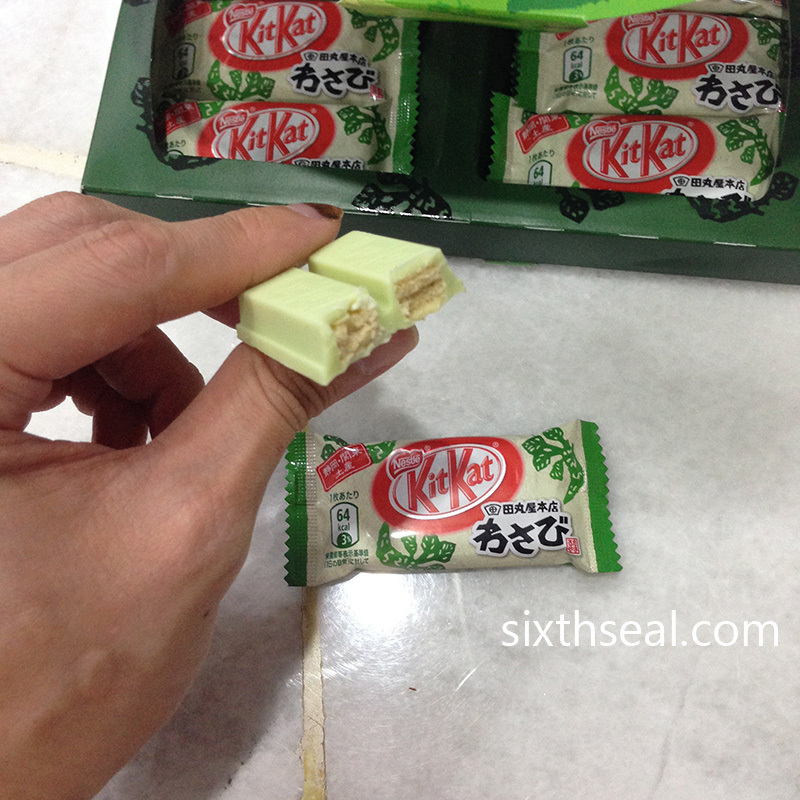 These Wasabi Kit Kat are more of a novelty item. I was glad I got the chance to taste them but I probably won’t buy them again. 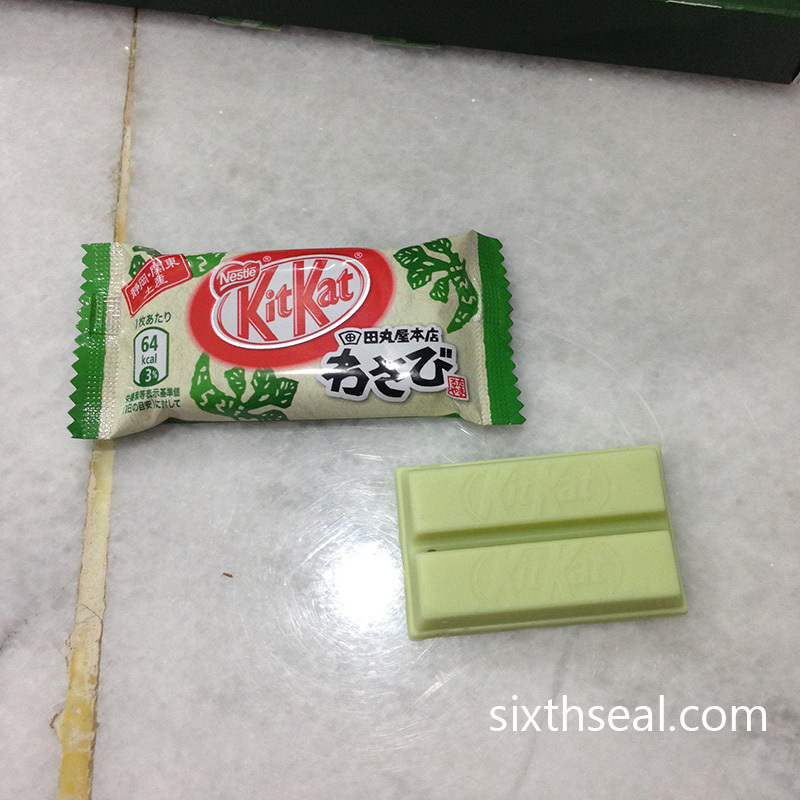 I love how Nestle Japan hooked up with an established wasabi producer to make these Kit Kats. The Nestle x Tamaruya partnership for this makes for a great story. It’s the perfect souvenir due to its exclusivity and a regional specialty to boot, but they’re really not that great to eat. I’m definitely keeping the box though. 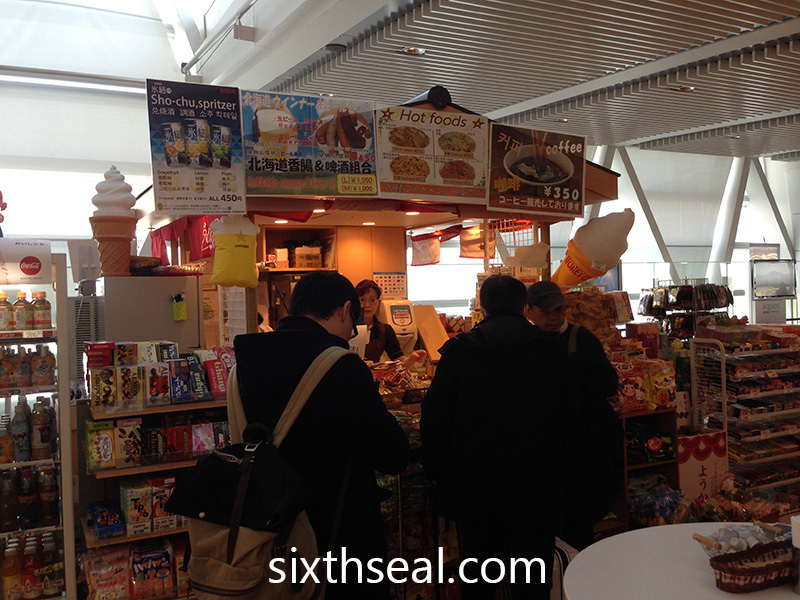 Oden at the airport? Yeah, that doesn’t sound like a recipe for success. We arrived at New Chitose Airport very early and was hoping to get something to eat before we boarded our flight. Unfortunately, all the shops are still closed. We’re too used to 24 hour service in our (relatively) large, bustling airports but a lot of the airports around the world aren’t open all the time. This one at Hokkaido only had a stall open but they serve oden, which I was keen to try. 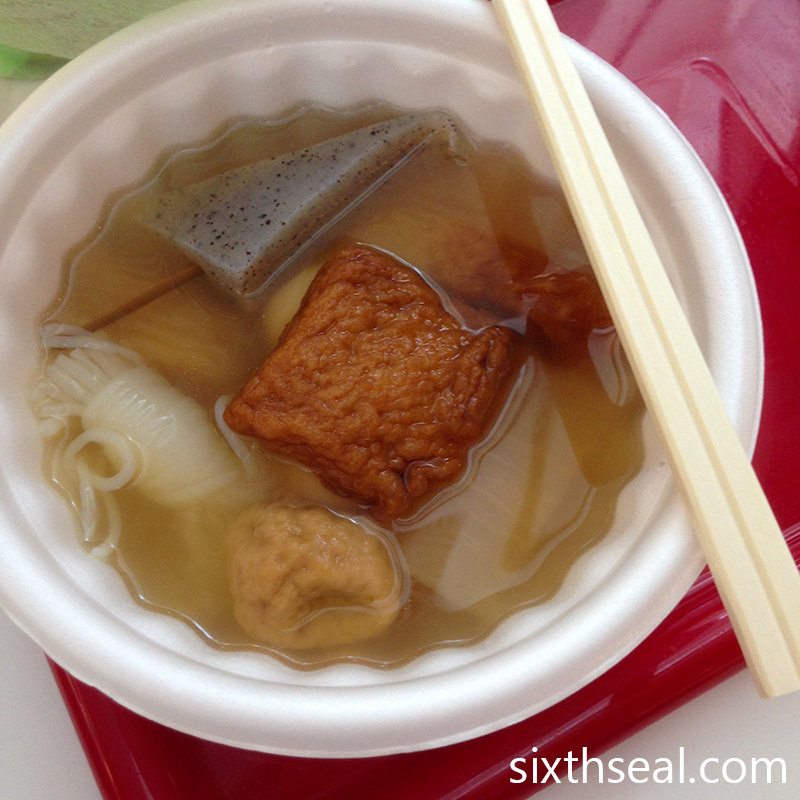 Oden (おでん) is a winter food in Japan. It’s made with a whole bunch of stuff in a flavored clear dashi broth. 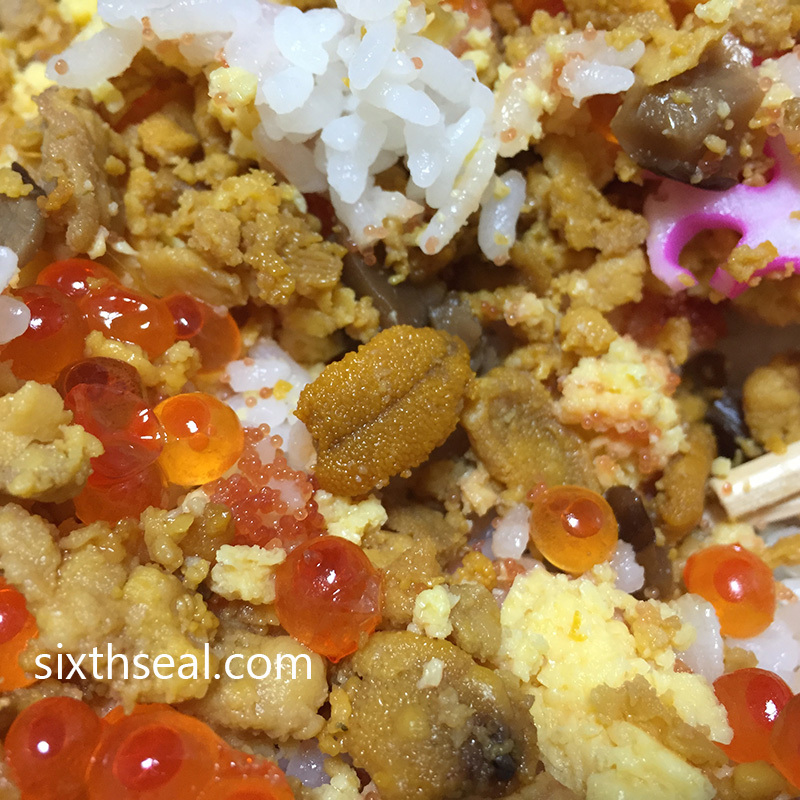 The usual ingredients are daikon, boiled eggs, konjac, and processed fishcakes. I love the texture of the shirataki (白滝) which is a noodle made from konjac – the transparent bunch you see in the photo. There’s also a nice chunk of konjac and despite not containing regular sources of carbohydrates, the konjac elements tricks you into thinking you’re consuming starch. 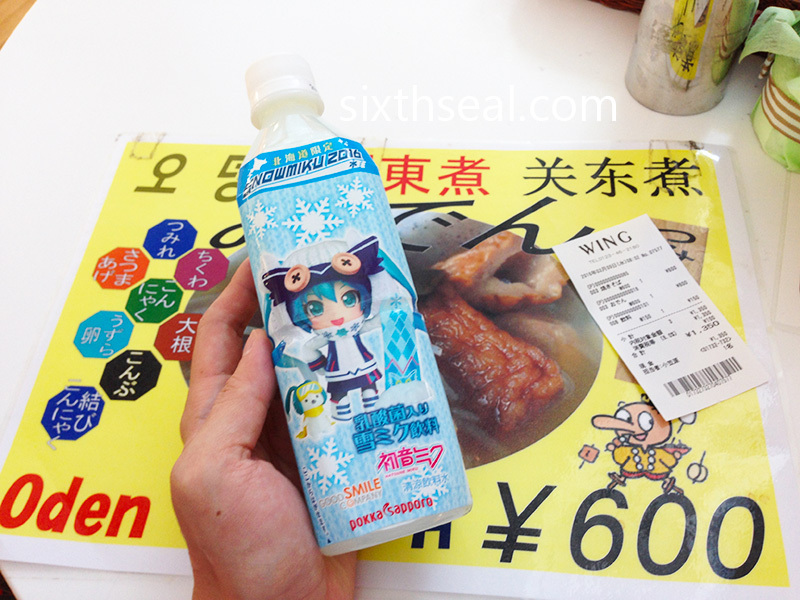 I also got a Snow Miku 2016 (translated from Hatsune Miku) drink made in partnership with Pokka Sapporo. The oden was 600 JPY (about RM 25). My better half got herself a box of noodles with some karaage to go with it. The oden was surprisingly decent. I would have thought it’ll taste pretty bad since it’s airport food but it’s actually rather good. I’ve seen oden being sold in konbini like 7-Eleven but there are so many things to eat that I’ve put it quite low on the priority list. I’m restarting my Invisalign journey due to some minor misalignments from the previous set of aligners. It’s a good thing Invisalign provides complimentary remoulds in the off-chance that your aligners went out of whack for some reason or another. That means I’ll be going in to get my moulds done again – this should take a couple of hours but I’m keen to get started so I can make sure that everything goes well on my end. I’ve gotten quite used to wearing Invisalign but it was uncomfortable wearing the same aligners for over a month. I had to keep my teeth in line while my new moulds were sent so that’s why I needed to wear the latest aligner (from the old set) until the new ones arrive. 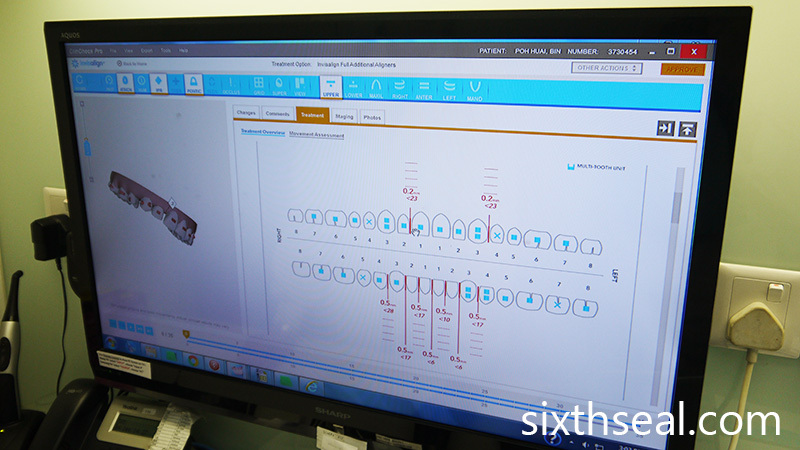 Thanks to advances in shipping (as well as in manufacturing) the new aligners should arrive pretty soon. The actual aligners are made in Mexico, or at least that’s what the packaging says, but the Invisalign technology itself is done it San Jose, California. House of Pakeeza is a rather strange restaurant. It looks like it had gotten lost in the 1970’s and popped up almost 50 years later. 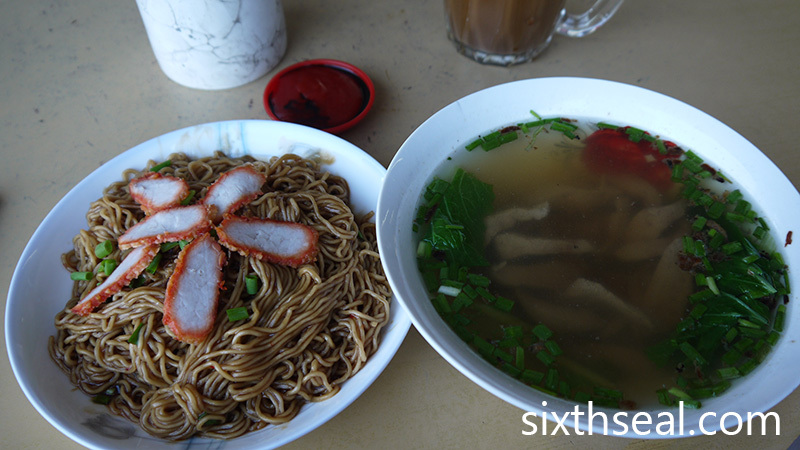 This eating establishment is located at a block of shops called The Right Angle in Section 14, Petaling Jaya. It’s a stone’s throw away from Jaya Shopping Centre. If you work around here, you’ll know that this area is horrifically congested. The narrow streets are often double, sometimes triple parked. I was craving for some nasi biryani and decided to pop over for lunch. 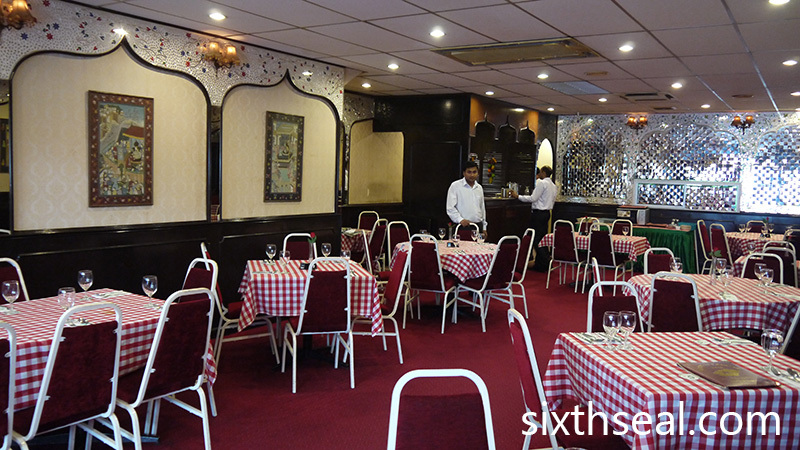 The dimly lit interior is manned by waiters in white starched uniforms. 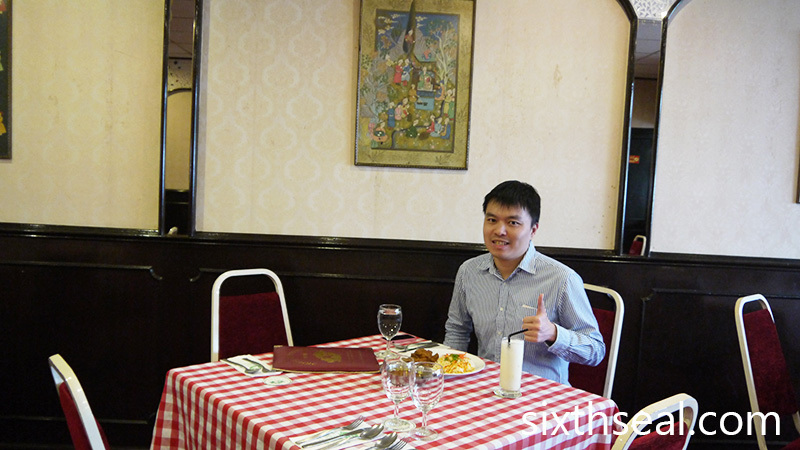 The dated chequered tablecloth is topped with old school wine glasses and adorned with a plastic rose in a glass bottle. It doesn’t look nostalgic as much as lost in time, with the disco era wall panelling reinforcing the illusion. It was also empty. I was the only customer there and it sounded like I was the only one who’s come in for a while. House of Pakeeza used to serve good nasi biryani, or at least that’s how old timers remember it. This might be true decades ago, but it certainly isn’t now. I ordered a Beef Biryani (RM 15) and was disappointed to see that the sad biryani rice is barely spiced and the beef isn’t cooked together ala Hyderabadi style. It’s just a very plain mound of biryani rice with chopped spring onions scattered on top (something I’ve never seen before) and a few slices of beef on the side. The beef was tough and barely edible. However, the eggplant curry served on the side was quite delicious. 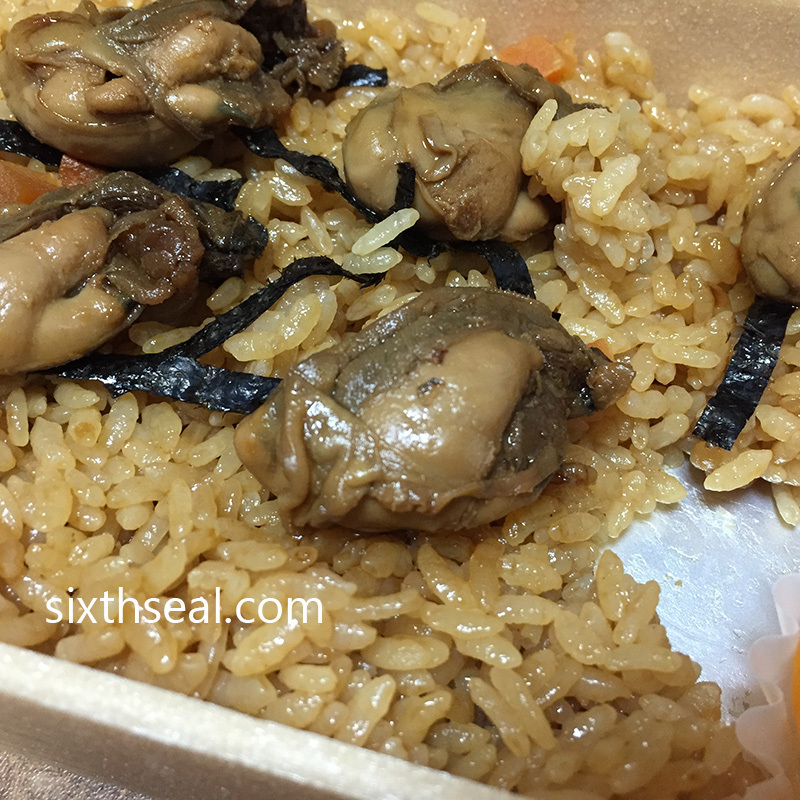 It had tons of flavor and was actually hot, compared to the room temperature rice and meat. I also ordered a Salted Lassi (RM 5.40) which also turned out to be good. The salty and acidic yoghurt drink was excellent. 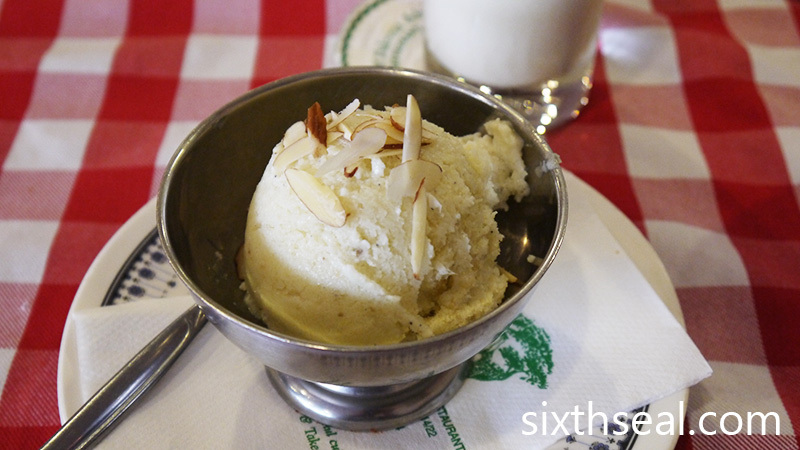 Pakeeza specializes in Moghul cuisine and they also carry a Northern Indian ice cream called Kulfi (RM 5.20). I had kulfi when I was in Sri Lanka and I loved the saffron flavored creamy frozen dairy treat. Kulfi is technically not “ice cream” per se but a type of frozen dessert from the Indian subcontinent. I was served a grainy cardamom and pistachio flavored scoop full of ice crystals. It tasted sandy and gritty, like it’s been melted and refrozen many times and way past its use by date. It’s the antithesis of a smooth kulfi. I would give House of Pakeeza a pass if you’re also tempted to try them out. The bill for lunch cost me RM 28.16 which is slightly below average for a similar Indian themed meal at the nearby Anjappar. 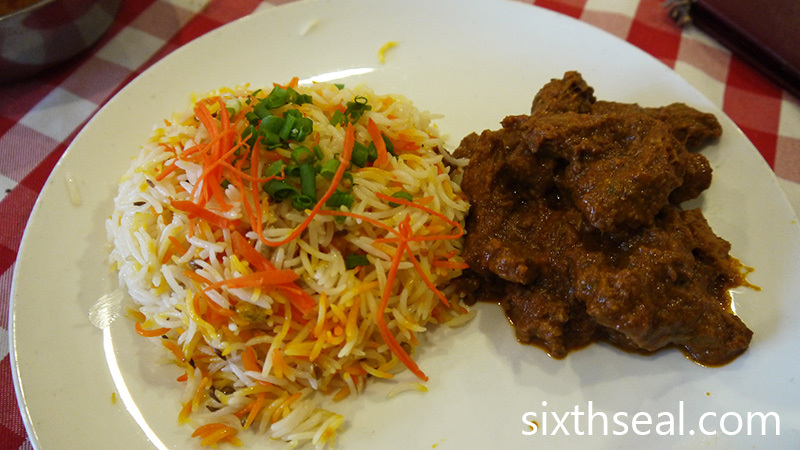 However, it doesn’t taste very good and left my craving for good biryani unfulfilled. There is a good reason this place is deserted while another Indian restaurant down the street is doing a roaring business. I should have gone around the corner to Anjappar instead coz they have really delicious biryani but I wanted to try Pakeeza. Oh well, I know where to go next time. “Look dear!” my better half exclaimed while tugging at my arm. 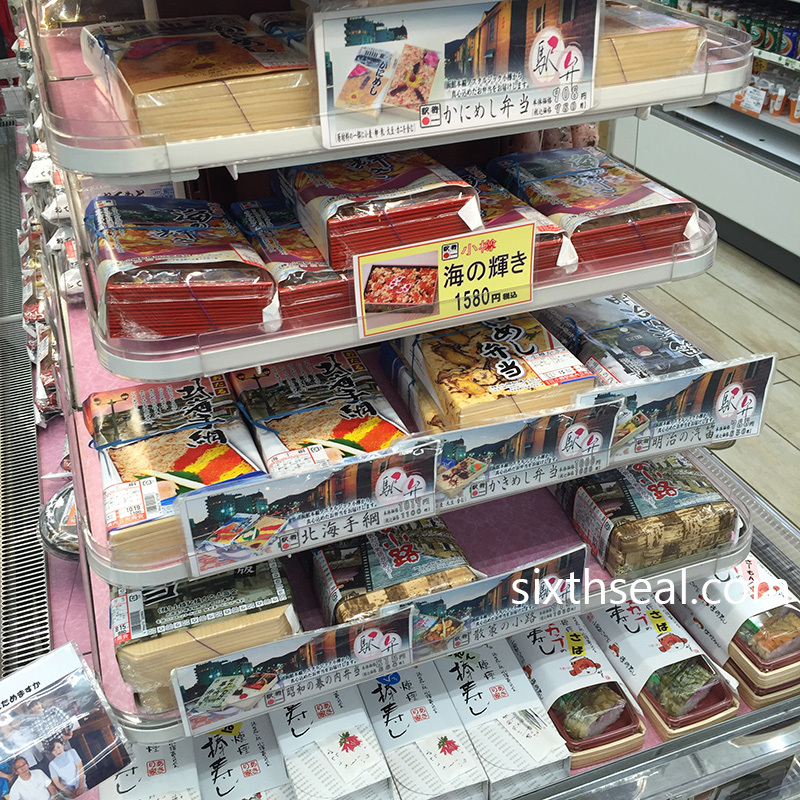 We were at Nijo Fish Market in Sapporo and there was a stall selling a trio of crab delicacies. We just ate at the Michelin rated Nanabe but I could tell she was intrigued by the crab bonanza so I ordered a set for us to try. You can get a Crab Steamed Bun + Crab Gratin + Crab Miso Soup for 1,200 JPY (about RM 50) or individually for 500 yen each. 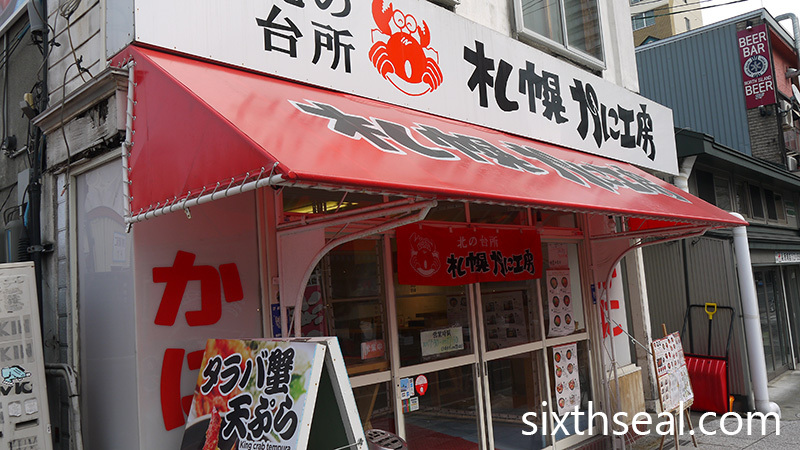 Hokkaido is famous for their fresh and local crabs. 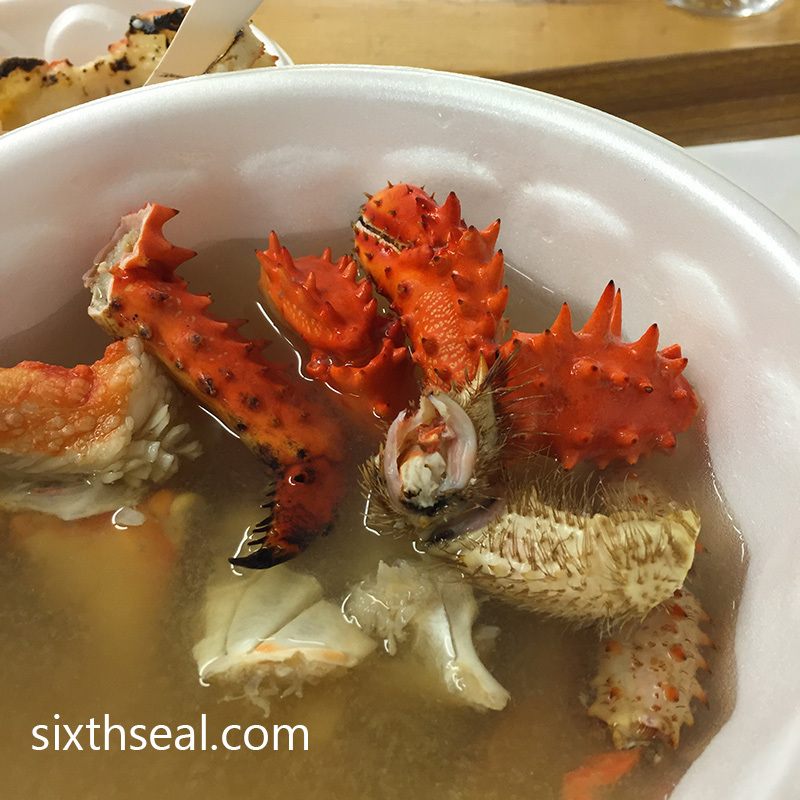 Red King Crabs and Snow Crabs are the most well known ones but they have other delicious and more obscure species that only foodies would know, like the Horsehair Crab and Spiny King Crab which we ate the day before. 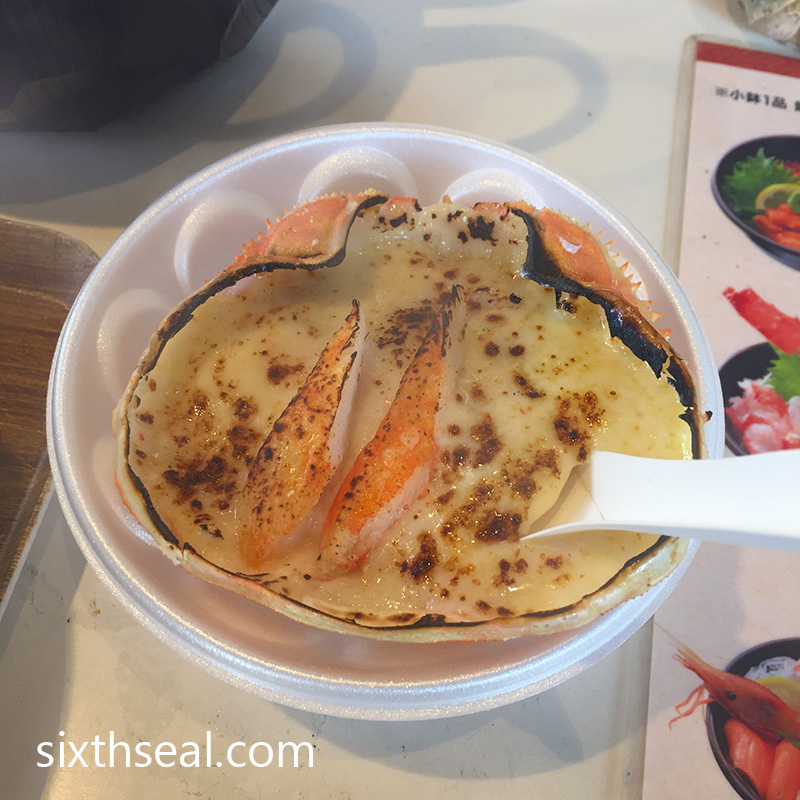 Otaru also has a variety called the Sand Crab. They’re all really good and if you want to have a crab feast, you’ll do no wrong in coming to Sapporo. The friendly owner did the Crab Gratin right it front of us. There is a makeshift bench and chairs in the open where 3-4 people can sit down while eating. 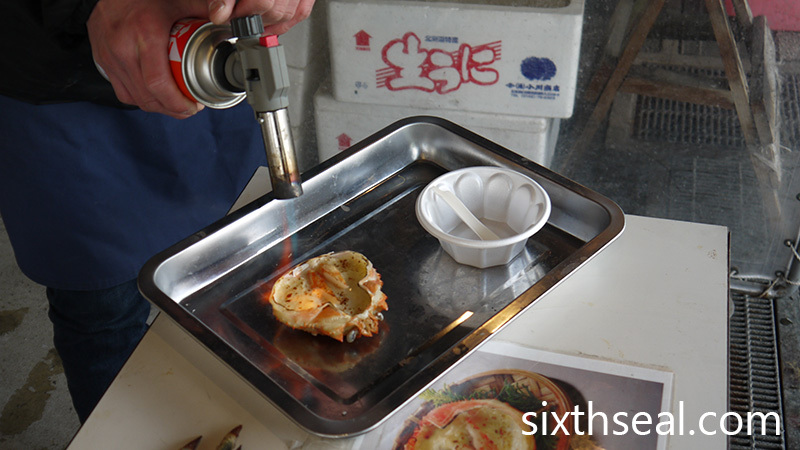 The crab in the shell was brought out and torched on the table. It was quite cold in Hokkaido and he suggested moving inside (to opposite the road) where they had a restaurant to get out of the wind and snow and so we did. It was about time for lunch and although I was still full from the Bib Gourmand ramen, I thought I should eat local Hokkaido crabs while I still can. 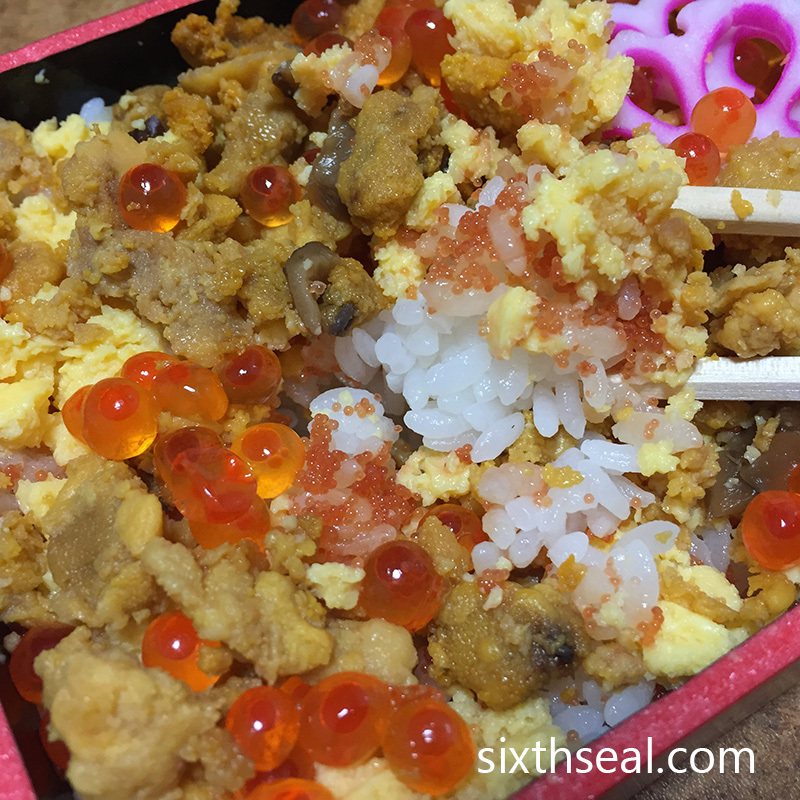 The place specializes in donburi – a rice bowl with regular hot rice topped with fresh sashimi. 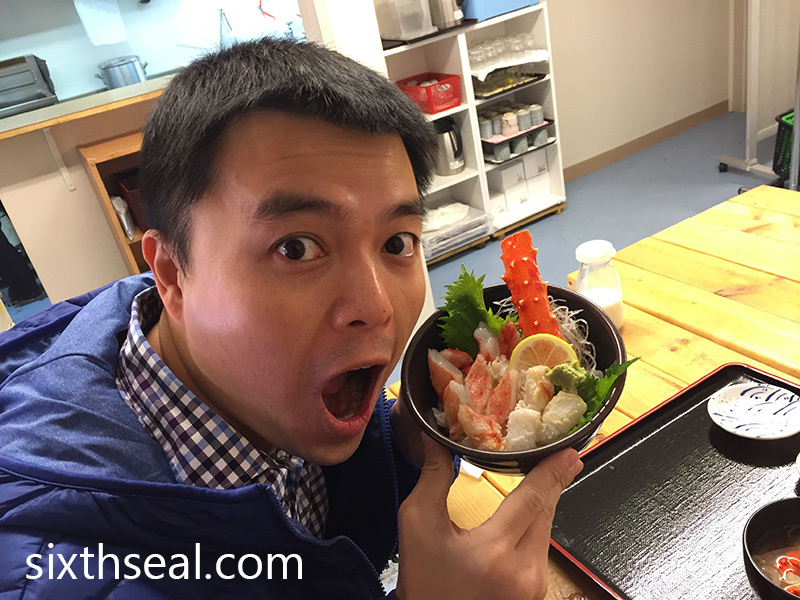 I went for the Fresh King Crab Sashimi Donburi (2,700 JPY or RM 110) and it was glorious! 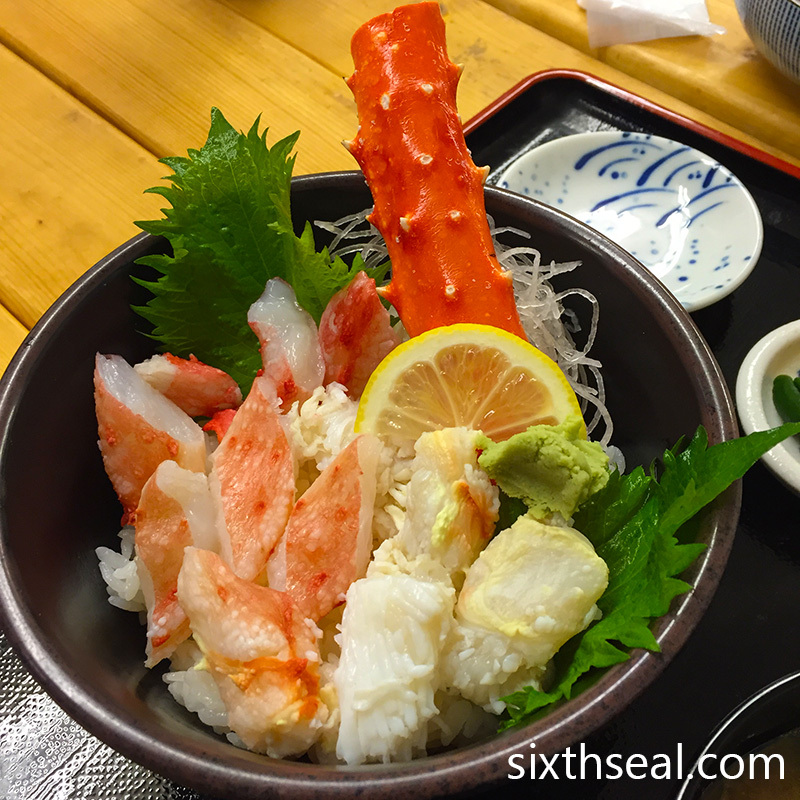 The donburi was topped with beautiful thick slices of raw Red King Crab. It was slightly more than a leg’s worth of crab meat. If you’ve never eaten King Crab before, the legs are super meaty. It’s not like mud crabs or flower crabs at all. The size of the meat from the King Crab leg is the same dimension as those highlighter pens you used in high school. The raw crab was slippery, clean and sweet tasting. Wonderful stuff. There’s nothing quite like eating king crab with shiso (perilla) leaves and a dab of real, freshly grated wasabi. They serve a mean bowl of crab miso soup too. It’s complimentary with my order of donburi so naturally it wasn’t as good as my dear’s 500 yen bowl. I present to you, the 1,200 yen trio of crab! This was taken in the cold outdoor seating before we came inside. The thing that actually caught her eye was the Crab Gratin. The kind proprietor actually helped us to take the dishes into his other shop across the street. There is a generous amount of King Crab meat in addition to the melted cheese, breadcrumbs, and butter. Good heartwarming stuff. 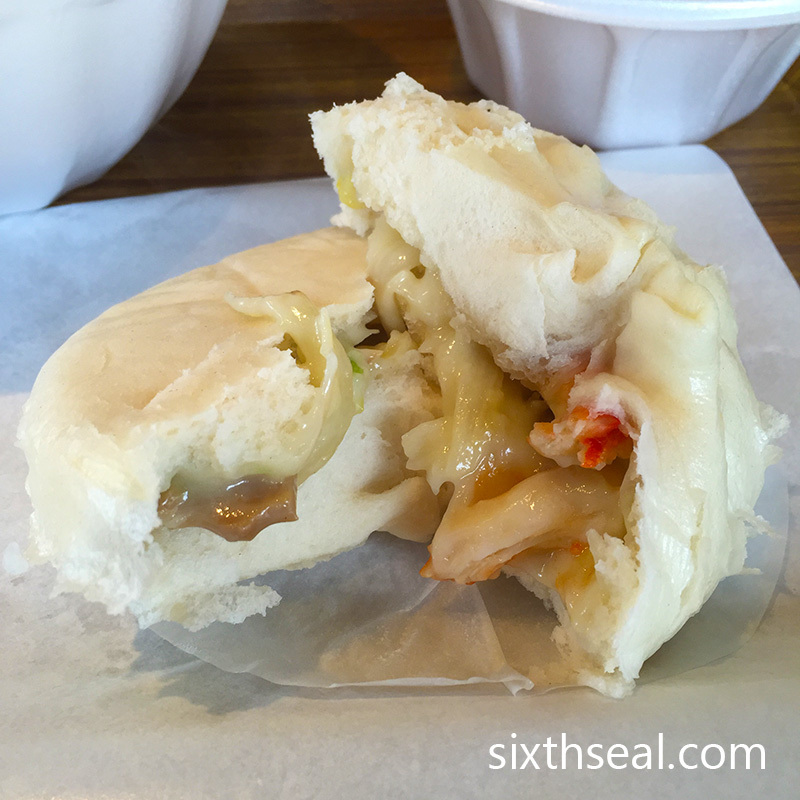 The Crab Steamed Bun was decent too. I knew my dear liked it so I didn’t eat too much (and besides, I had my own donburi) but the tiny bite I had tasted delicious. 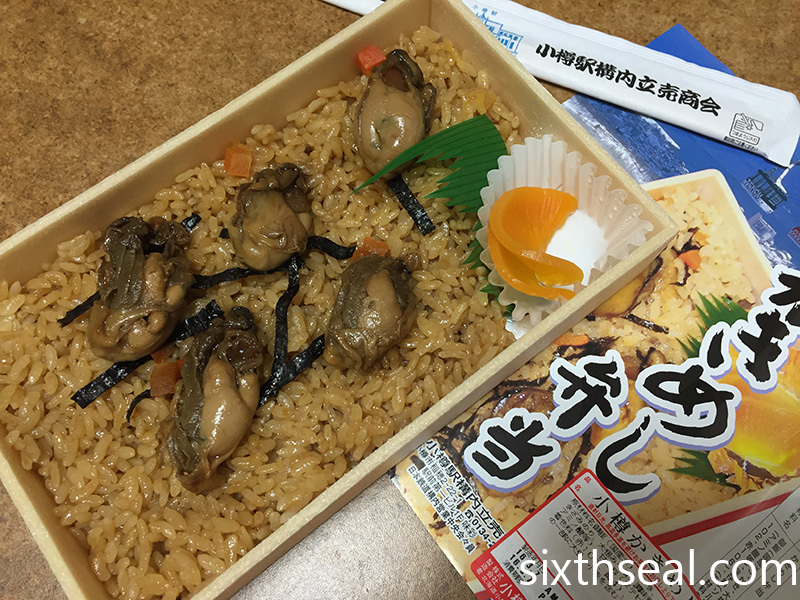 There are only two items inside – vegetables and crab. They really stuff a lot of real Red King Crab meat inside. 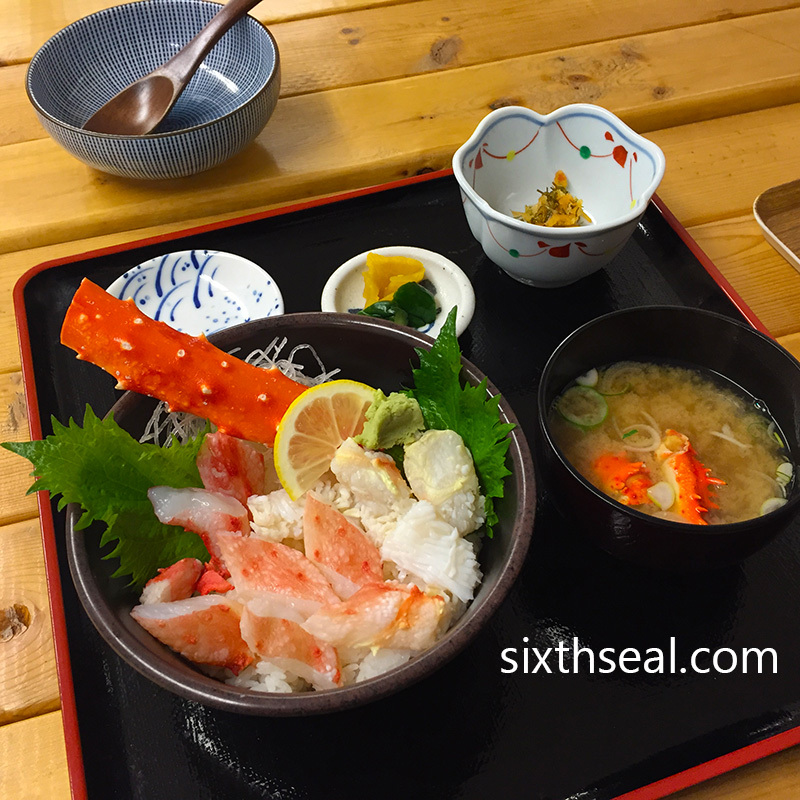 Check out my better half’s 500 JPY bowl of Crab Miso Soup from the “Crab 3 Ways” set. It’s truly a luxurious bowl of soup. 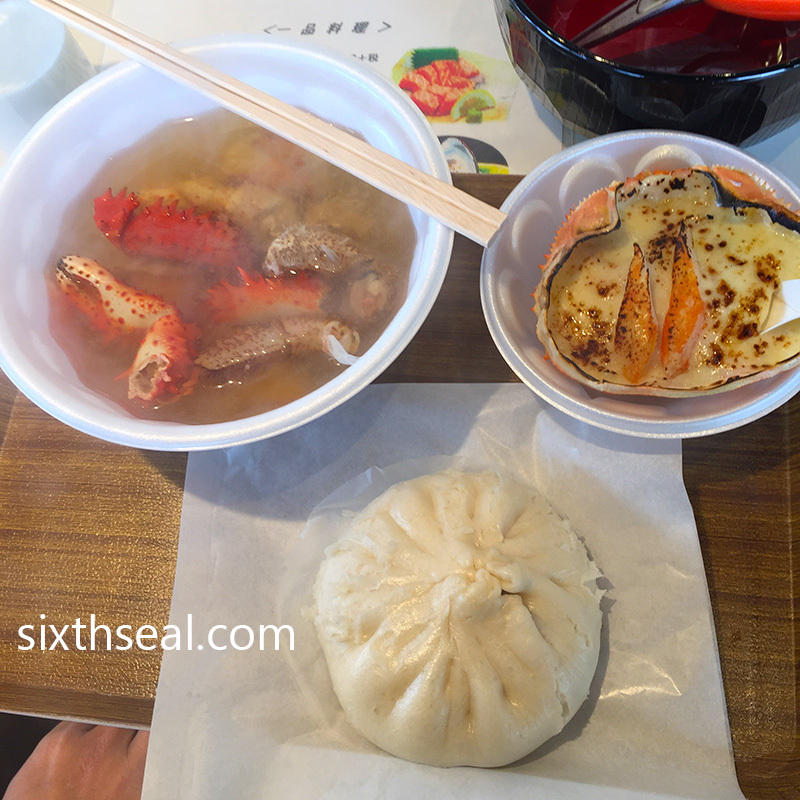 They use Horsehair Crab, Red King Crab, and Spiny King Crab inside – all three are wonderful in soup, especially miso soup. 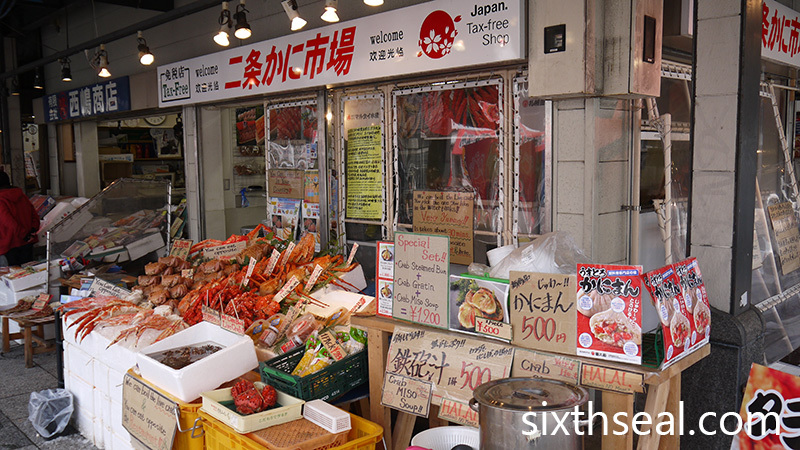 The stall at Nijo Fish Market actually sells all varieties of local Hokkaido crabs so the dishes are made from fresh crab meat. 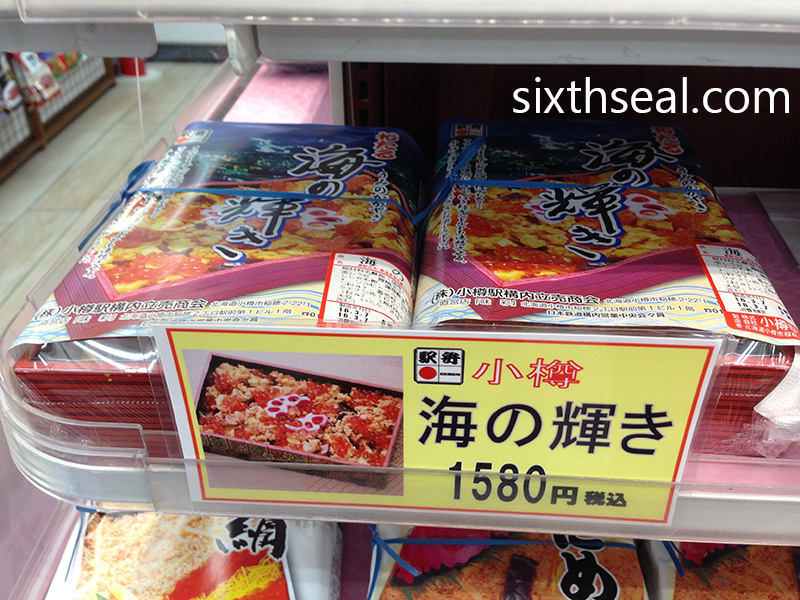 There is a lot of said crab meat too, I guess what they don’t sell in time gets turned into food. 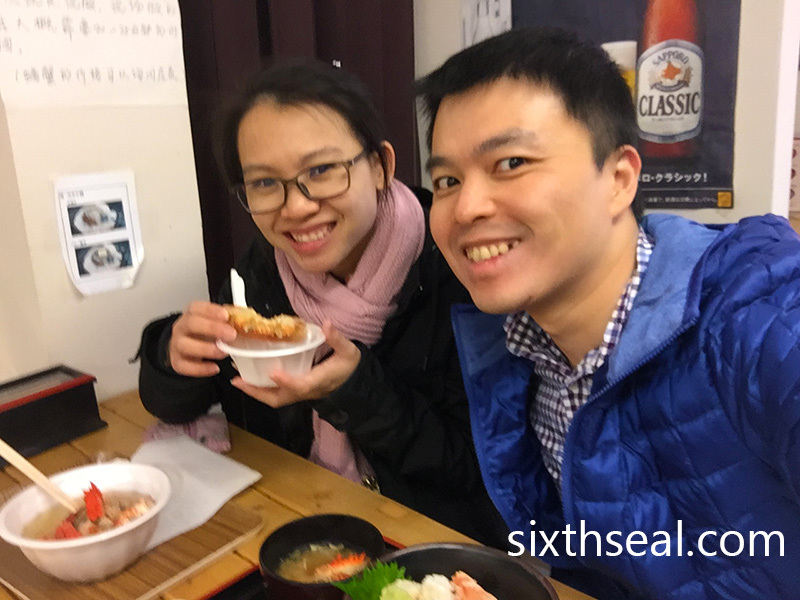 The Japanese are really serious about freshness – even a day is considered “old” so you’ll be pleasantly surprised when you eat crab in Sapporo. There are also many “crab buffets” in town but I would personally avoid them. The locals don’t go anywhere near crab buffets coz the quality is nowhere near as good as the stuff you pay for in the markets. I don’t mind paying extra for awesome quality crab and this was the best! Save electricity like a boss! It’s the El Nino season and that means we’ll have plenty of hot, sunny days to look forward to! Or not. Most of us dread the heat wave that comes every time this year. We turn to the air conditioning on full blast and shut ourselves indoors to stay away from the heat. Heck even our home appliances like fridge operates on more electricity to stay cold; influenced by the residual heat from our home. TNB has released figures which shows Malaysians use a peak demand of 17,171 MW last month (a staggering figure and an all-time high) and there have been news reports which featured a few residents getting shocked by their bill (not literally). This really helps. Keeping your air conditioner filter clean is important in making in run efficiently. More cool air flows out of a clean filter so to take a huge amount off your bill, take out your filters and start dusting them. It’ll also help make the air cooler! Turn off the lights when you’re going out. You really don’t need a lamp to be on while you’re out, it just wastes electricity. That little bit can really add up so make sure all your switches are off before you go out. If you tend to be forgetful, you can try sticking a bit of tape beside your switch to remind yourself to switch it OFF before you leave. This works wonders in an office too – put something up like “Last one to leave, hit the lights”. The energy saving light bulbs might cost more at first but they really do use a lot less energy in the long run. It’s just a little bit more to pay up front and you can easily recoup the cost back via energy savings (and then some). There are also slim florescent lights like the T5 variants which provide more brightness while consuming less energy so if you’re still using an old model or a non-energy saving bulb, make a trip to your local hypermarket to pick up one and start taking a huge chunk off your bills today. Have you seen these stickers around electrical appliances? This is actually a rating that can help you reduce electricity consumption. Whenever you need a new kettle/fridge/washing machine (or any other electrical appliance) make sure to see how efficiently they run. These stickers rate each device and they can really cut down your bill over the long run. Make sure to go for as high a rating as possible, 5-star if possible. Those are the most efficient appliances and you can rest assured that buying a 5-star device can give you 5-star savings. We love to be on Facebook and watch YouTube videos and some of us has even taken off the settings so the notebook or PC is on forever. The features to turn off your monitor and hard disk after a set amount of time is there for a reason – when you’re not using it, it’s better for the device to be off. This can really help you save so make sure the settings are correct and when in doubt, just turn off your computer when you’re done. Need more cool tips to help you save? Surf on over here! I read about a ramen shop called Nanabe (菜々兵衛) which was awarded with the Bib Gourmand in the Hokkaido Michelin Guide during our trip to Sapporo. I really wanted to go there so we poured over the transportation maps before trekking out to this secluded neighborhood in Shiroishi-ku. This ramen restaurant is located in a residential area quite far from the usual places tourists go so it was challenging to find. 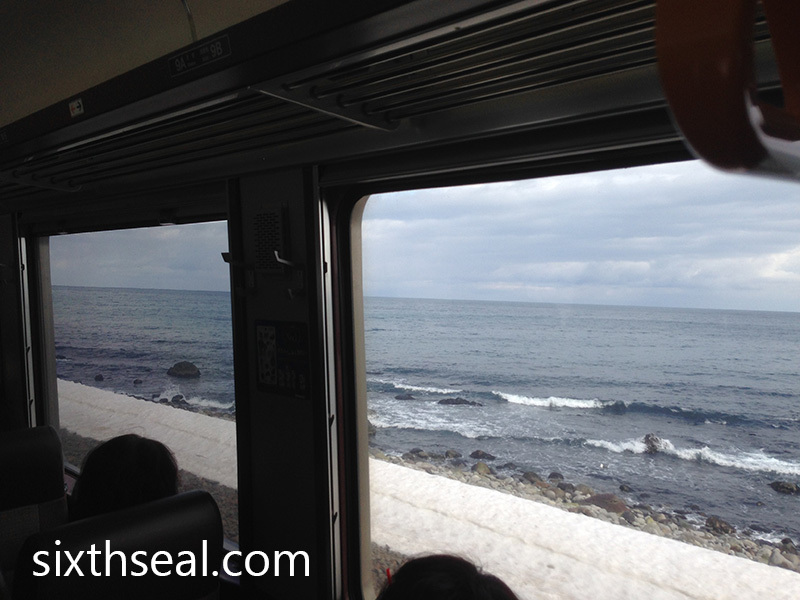 We trudged through the crunching snow and slippery ice for about 30 minutes after a 1 1/2 hour train ride involving 3 different lines to Heiwa. No one here spoke English and they only have a Japanese menu so ordering involved deciphering the menu with Google Translate app and a lot of gesturing. The crowd consisted almost entirely of salarymen and OL (office ladies) from small businesses nearby and there is usually a bit of a queue to get in. You need to take off your shoes at the door. I have seen this arrangement in the ryokan we stayed in but it was really unusual to have to do this in the city. However, this isn’t the city center of Sapporo per se, it’s more like a friendly rural neighborhood joint. I took off my soaking wet shoes and lined them up with the row of other customer’s shoes beside the entrance. The tables are shared tables and we were seated beside two friendly lady office workers (who took a photo of us). 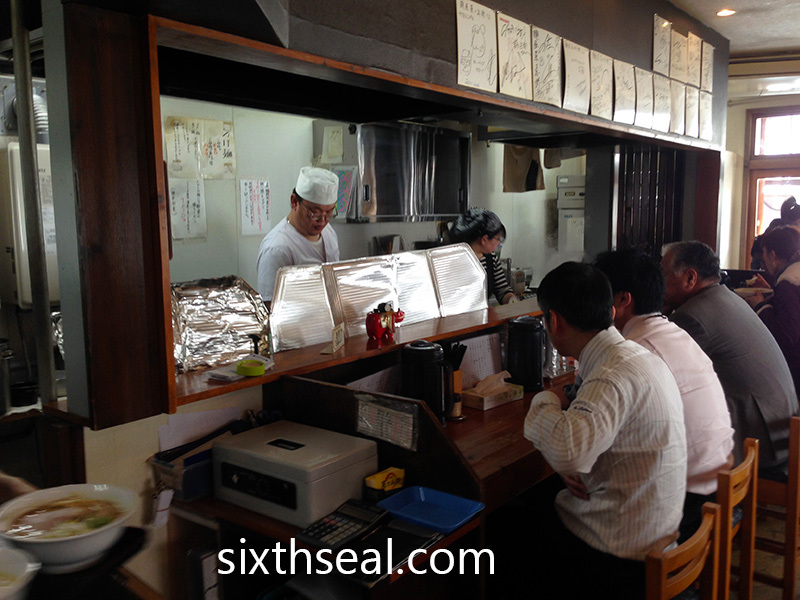 I ordered the flagship Salt Ramen with White Chicken Broth (鶏白湯 塩) for 750 yen (about RM 30). 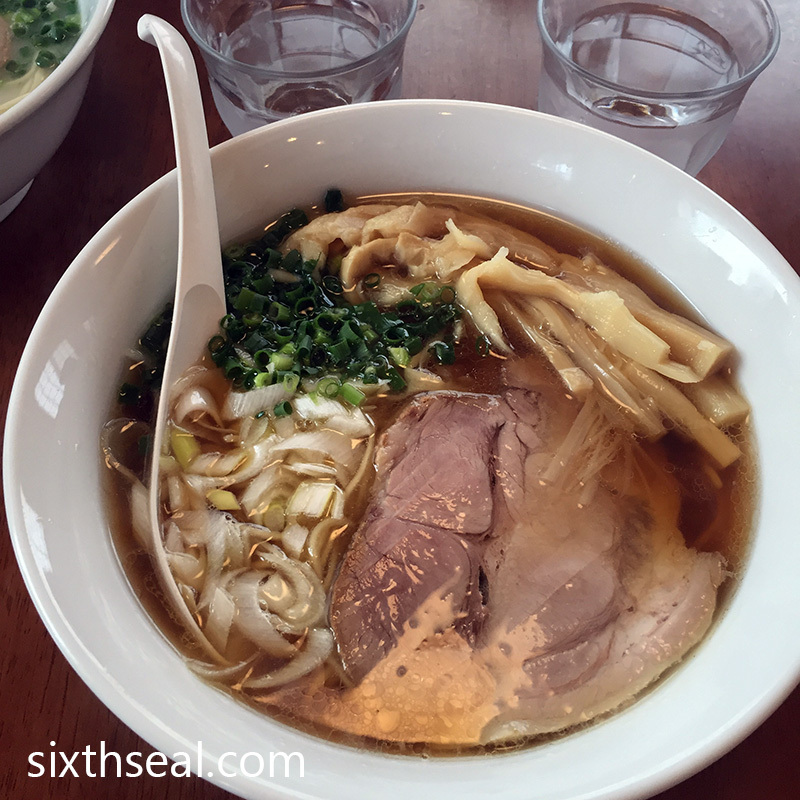 The broth is rich and almost creamy. I practically inhaled the ramen and slurped down the soup with satisfaction. 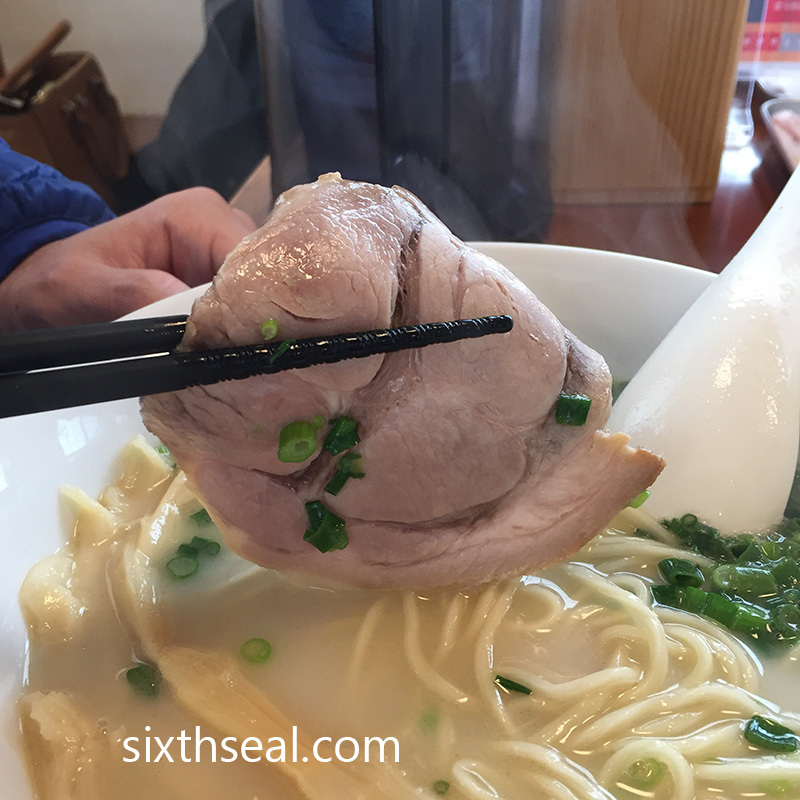 The chashu was perfectly done – a beautiful pinkish brown slice of pork perfection. 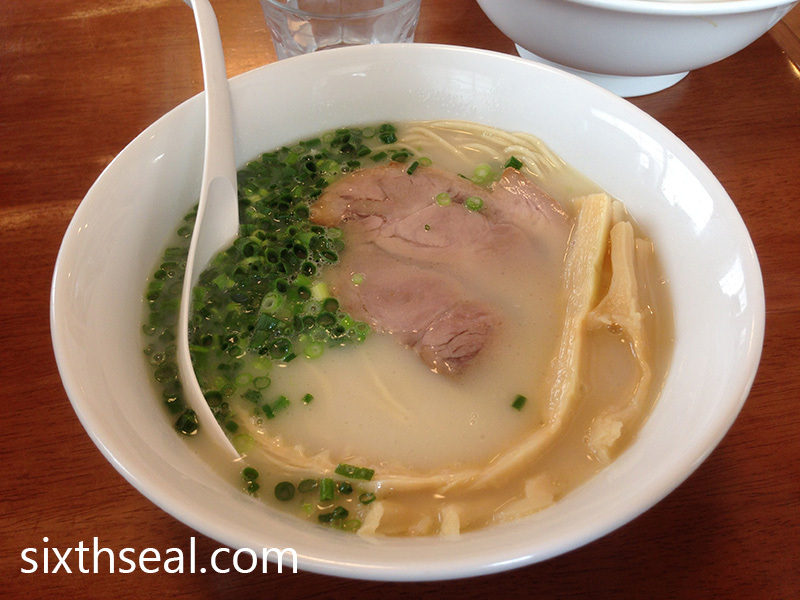 The generous scattering of menma and spring onions added a lot of flavor to the broth. It’s strange that I find tofu offensive but I’m happy to scarf down menma. The homemade ramen noodles are springy and texturally pleasing. This is ramen done right. The signature ramen served here is not the usual miso soup base which Hokkaido is famous for but a white chicken based broth. They also have a “Nagoya Cochin” style. The noodles they use are not Sapporo egg noodles too, which my better half dislikes, but a more neutral and less rich wheat variant. They also give you a lot of menma (fermented bamboo shoots). 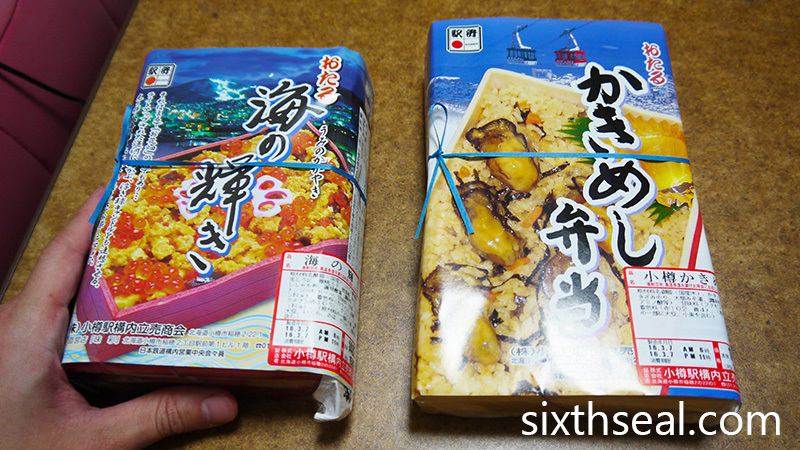 Nanabe uses hosaki menma, which is thinner than regular bamboo shoots and more absorbent. There are even menu options for extra menma which my dear looked upon with horror. Haha. She went for the Nagoya Cochin Shoyu Ramen (名古屋コーチン 醤油) for 750 yen (around RM 30) and it tasted completely different from mine. It has a lot of chopped leeks. I ended up eating all her menma. I enjoyed the shoyu broth her ramen was made of, both the original tori sayu shio (my order) and Nagoya Cochin shoyu are good options since they taste equally good but Nanabe is famous for the white chicken stock. You can also add condiments (red pepper flakes, sesame seeds, etc) to your broth to change its character – it’s provided free of charge, together with complimentary ice water. The ramen here is really delicious! It was very rewarding to enter a warm, bustling neighborhood restaurant after walking in the snow to eat a piping hot bowl of ramen. 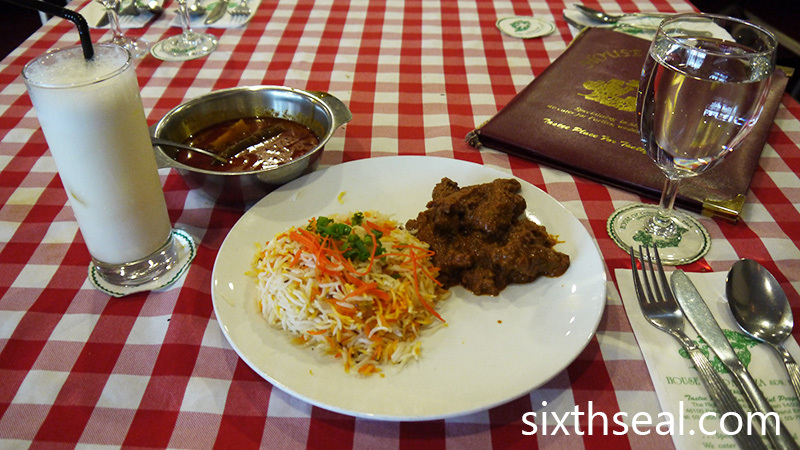 The service here is friendly and personal despite the language barrier – it reflects the country vibe of the place. The bill came up to just 1,500 yen (RM 60), which was a lot cheaper than the Hokkaido style ramen we had earlier. I would highly recommend this place if you’re willing to hunt for your food. 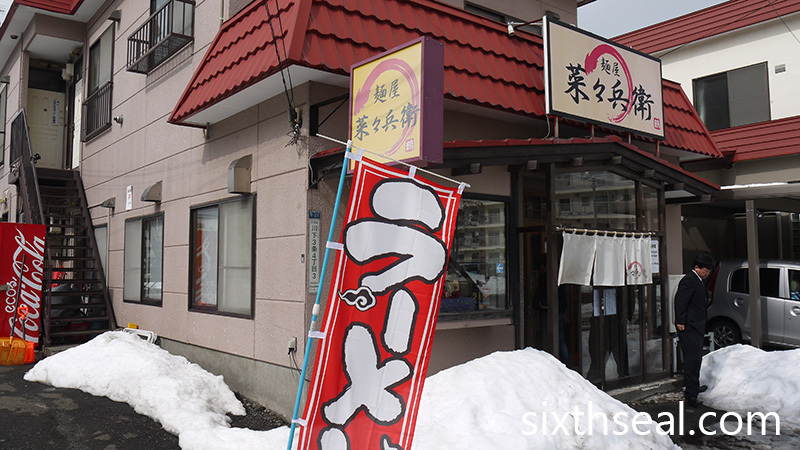 Nanabe was awarded a Bib Michelin for good reason – the food is spectacular and they’re rated as the #1 ramen in Hokkaido! 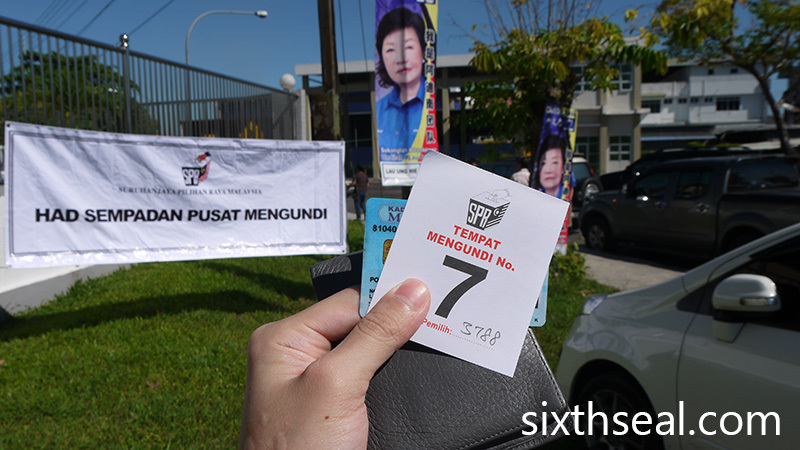 I’m back in Sibu for the Sarawak state elections! I just bought my ticket a couple of days ago. To be honest, I didn’t feel like flying back to vote. There’s been a lot of talk of “political fatigue” and I think that’s the general feeling among the masses. 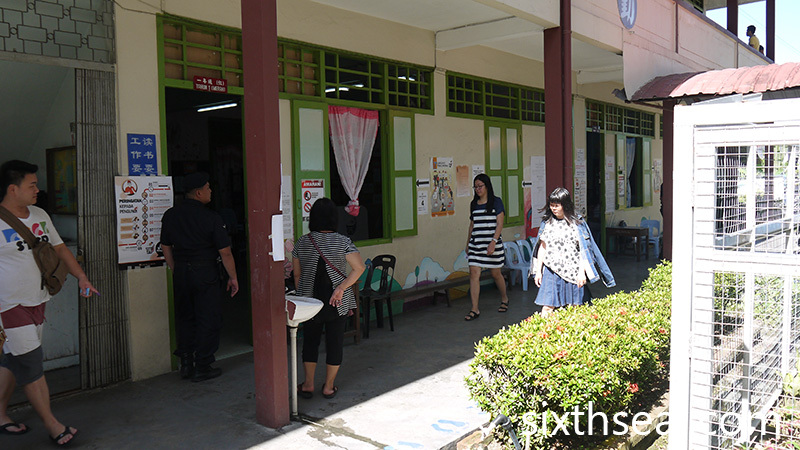 The people aren’t swarming the polling centers like the “Chinese tsunami” last election to protest against the government and the love affair with the Opposition might have plateaued. Whatever the reason, a lot of people aren’t making the effort and spending the money to come back to vote. I felt the same but at the last minute decided to shell out the cash for a plane ticket to exercise my right to vote. I am privy to a rather interesting political Whatsapp group and despite not contributing much, I read every single post. These are a bunch of diverse people from traditional media journalists to ex-political party members from SUPP, a BN offshoot in Sarawak. I heard someone mention that this Sarawak state election is a referendum for Najib. I was quite surprised since I have never thought of it that way. I think a lot of people like me don’t see it that way. 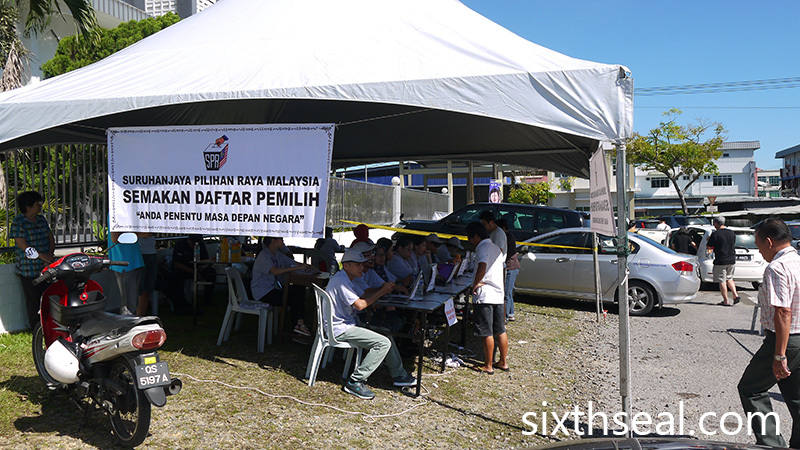 Instead, we see it as a referendum for Chief Minister Adenan. These are two very different people. I’m an Opposition supporter. 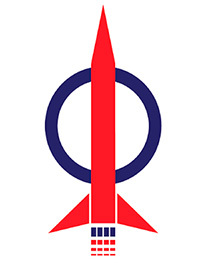 I vote DAP (Democratic Action Party) every single time. I come from a middle class Christian Chinese family in Sibu, Sarawak. To make parallels with the political scene in the United States, I would be considered as a WASP – a rather conservative voting bloc. I go to the BERSIH rallies. I told my better half that I come from a Chinese majority town and even she was surprised when I showed her the official government census data from my area. 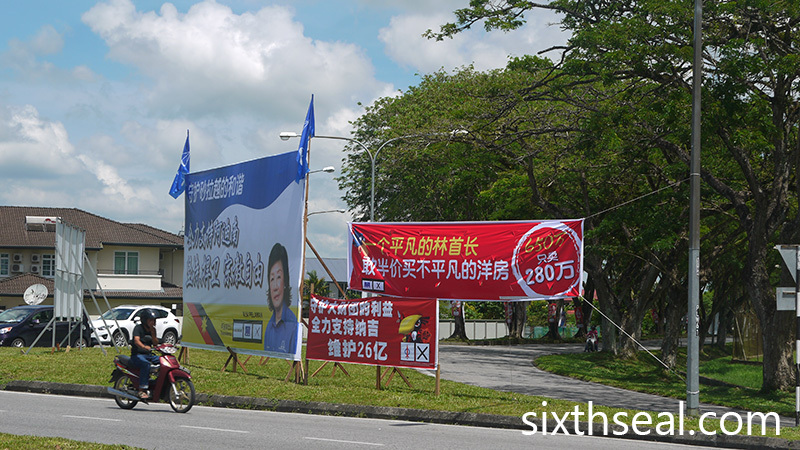 I vote in a constituency known as N54 Pelawan and out of the eligible voters, a staggering 91.2% is Chinese. The distant second is Malay AND Melanau combined for just 4.9%. This is often refered to as the “Muslim” voting bloc but that isn’t entirely correct coz a lot of Melanaus are Christian. Ibans constitute another 3.1% and the dreaded term Others come in at 0.8%. These figures aren’t representative of Malaysia as a whole but it’s fairly accurate for Sibu. What surprises a lot of first time visitors is how many churches we have here. We don’t have a lot of mosques – they’re all tucked away in kampungs and such, but there are many churches in town. 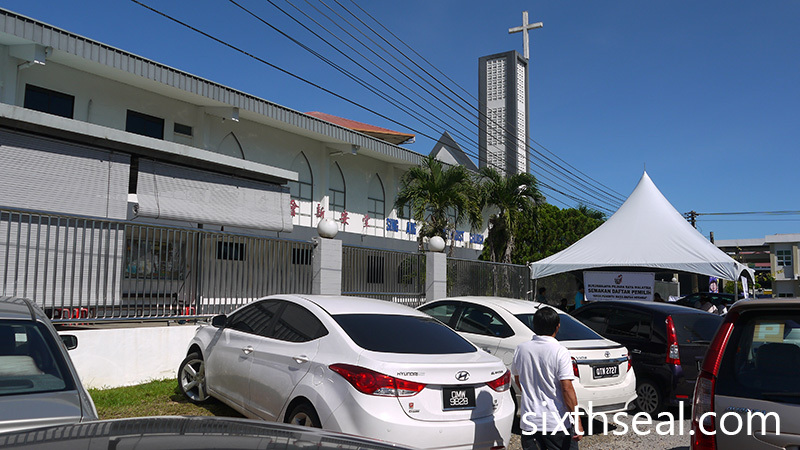 Sibu is an overwhelming Chinese majority town and a sizable portion of the Chinese are Christians. This unusual quirk is due to the person who first came to Sarawak (he was a Christian evangelical) but that’s history, what is interesting is our demographics now. Anyway, as I was saying, I (and I bet a lot of others) see this election as a referendum for CM Adenan and to be fair, he seems like a great guy. I can’t deny that he has done a lot for Sarawakians. He has also stemmed the worrying trend of Islamic extremism by keeping a ban list of extremist preachers and passed a controversial law which allows Muslim converts to revert back to Christianity (in the landmark case of Roneey Anak Rebit). This has endeared him to the local Christian Chinese community and he was also the first to open the civil service to UEC holders (a Chinese examination). The latter doesn’t really affect me since I’ve studied in New Zealand ever since I was 15 and graduated from Australia (this blog started in Melbourne), but it’s nice to know he’s looking out for everyone. He has also pushed for greater Sarawak autonomy and rights. By most accounts, he’s doing a stellar job. However, I was also talking to some older people today and they all saw it as a referendum for not Adenan but for Najib. That makes it an entirely different issue altogether but the problem is, not many people see it that way. I certainly didn’t, and I think that’s one of the greatest successes of the PBB political machine. They have pushed the man Adenan so much that a lot of people (myself included) have divorced the national issues with Najib from the Sarawak state election. …and that’s dangerous coz if BN does well here, they’ll have the confidence to call the general elections sooner. Despite what I personally think about CM Adenan, I feel like it’s healthy to have a strong Opposition and that’s why I will always vote for DAP. It’s not coz they have a realistic chance of winning – it’s about not giving the current government such free and unchecked reign. 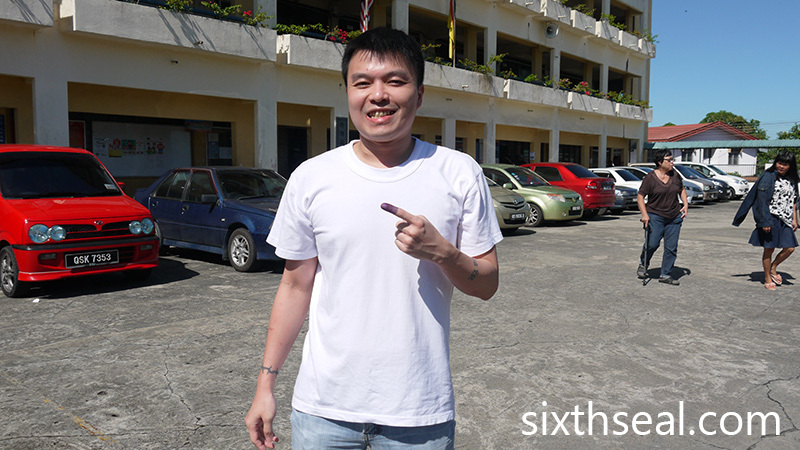 I voted for David Wong Kee Woan (DAP). Lindsay is back in Malaysia! Well, at least she was yesterday, she’s since flown off to Bangkok for more durian adventures. I picked her up for some durian late afternoon and we headed down to Sri Hartamas to check out a stall that has been around for over a decade. 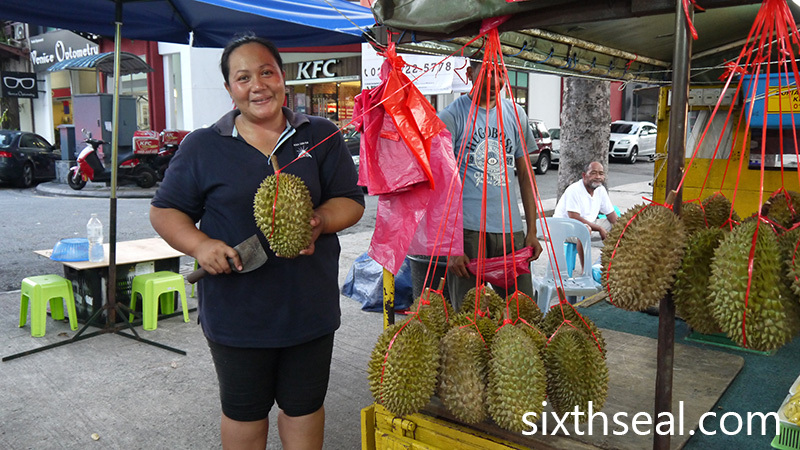 We saw some durians for sale at another stall before this but they weren’t really good so we moved on. This one only had two types of durians – Durian Kembong and Udang Merah (Red Prawn/Ang Heh). 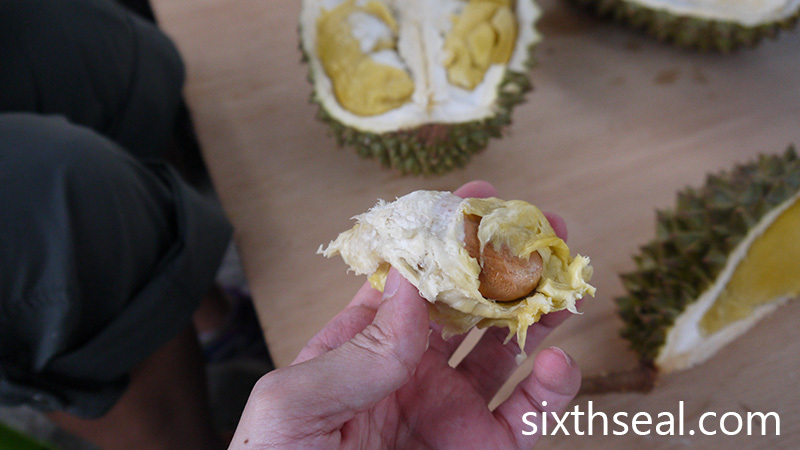 Lindsay chose the durians – she’s way better in these things, having volunteered in durian farms and such. 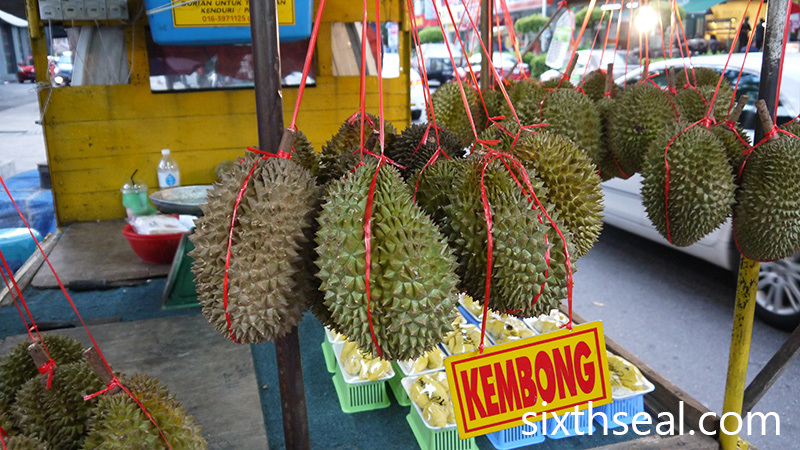 The durians they sell as Durian Kembong (I’ve never heard of the name) is actually D123 Chanee according to Lindsay. I’m not sure if “kembong” (which means inflated) is local slang or some kind of identifier but it’s not in the list of durian clones. This is a 1.7 kg beauty that Lindsay picked out. It costs RM 25/kg. The durian comes from Gerik in Perak. 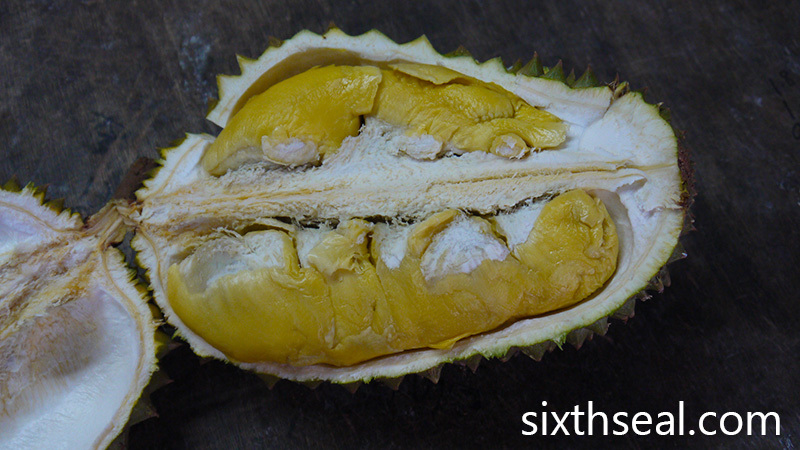 The Durian Kembong flesh is a pleasing saffron color and the seed can be seen “peeking” out, much like a Chanee or Musang King. I thought it tasted quite nice – there was little to no fiber and there is a sheen of slippery flesh on top of the main bulk, which makes eating it a pleasure. The durian was mostly sweet, with hints of bitterness and overall a decent, if not exceptional, durian. This Udang Merah comes from Gerik, Ipoh instead of Penang. It’s a small 900 gram fruit that was going for RM 28/kg. 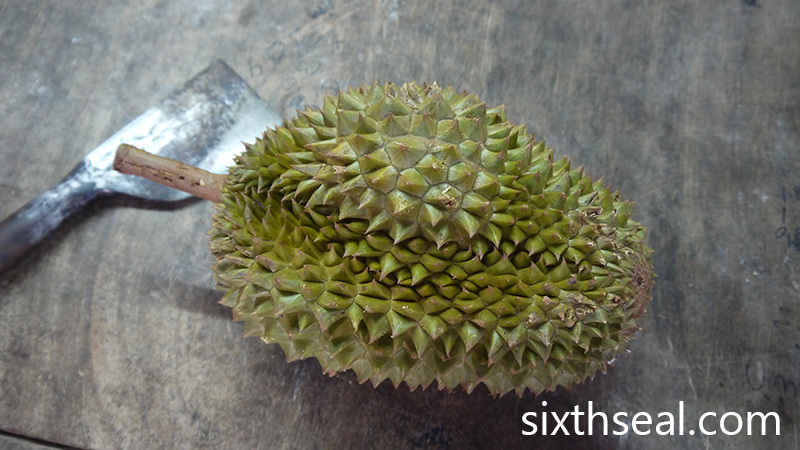 This small durian only has a couple of seeds but it was awesome! The vivid golden bronze flesh looked beautiful and the intense flavor was spot on. 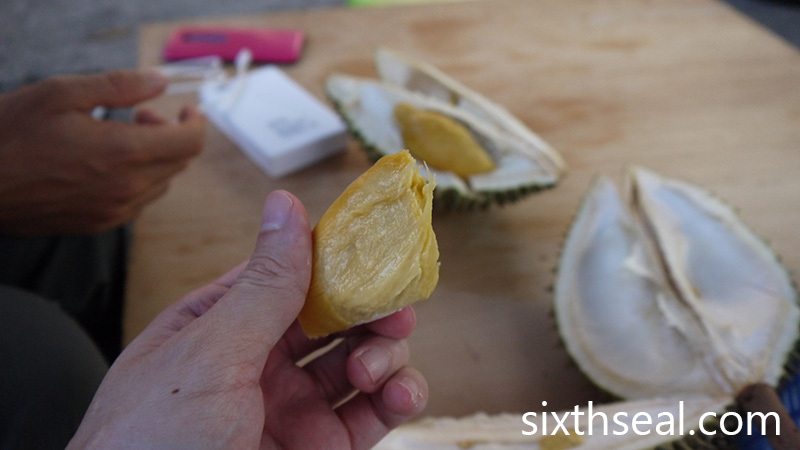 I was very pleased with the taste – it was rich, flavorful and strong, everything I look for in a durian. Creamy and succulent, no complains about this one. 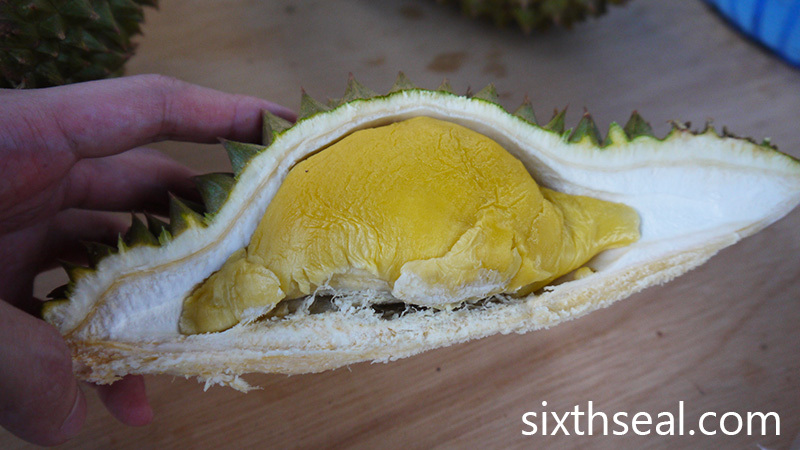 It’s a good thing that we opened this as our second durian and not the first, or the Durian Kembong would have fared poorly in comparison. Haha. The total came up to RM 65. 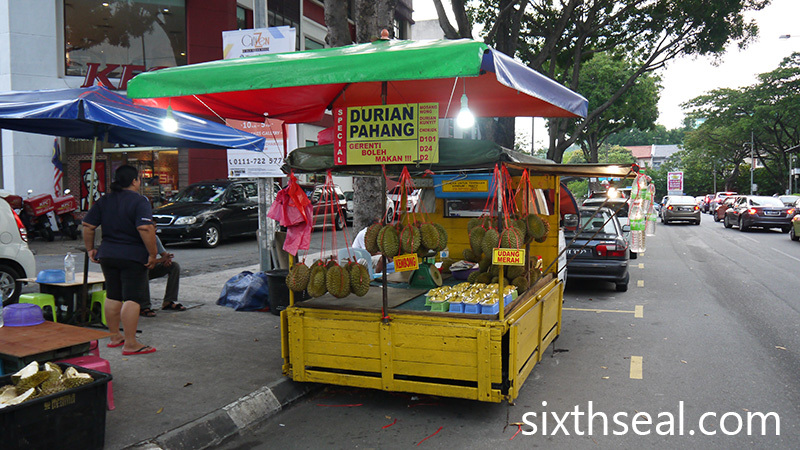 This stall also sells tempoyak (fermented durian paste) made from lower quality durians they couldn’t sell. It was good to meet up again Lindsay! I really had fun talking to you. Sorry I had to run off so quickly after the durians. Catch up soon when you’re back! 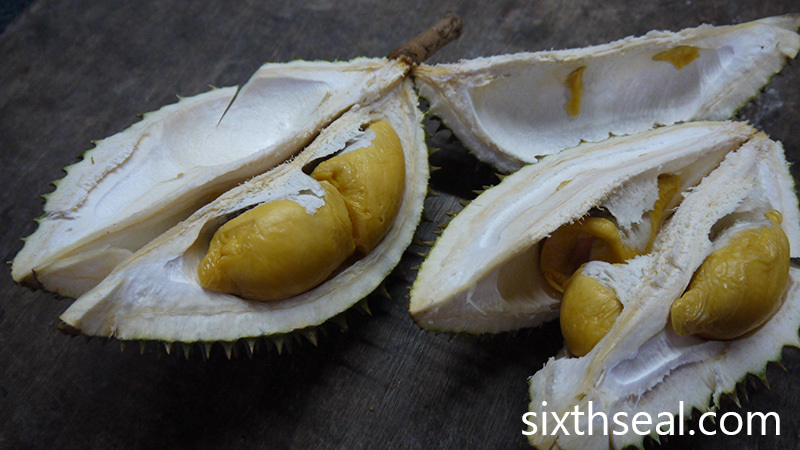 BTW, if you guys are interested in durians, Lindsay is running a durian tour in Bangkok from 25th May to 3rd June. You can surf over to her blog to register – she responds promptly (better than I do with my emails anyway) and the tours are open to all. 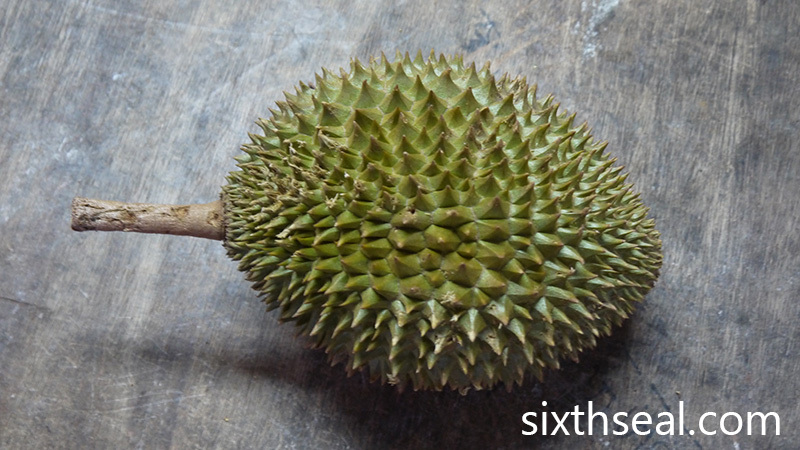 It’ll be fun if you want to learn more about durians.